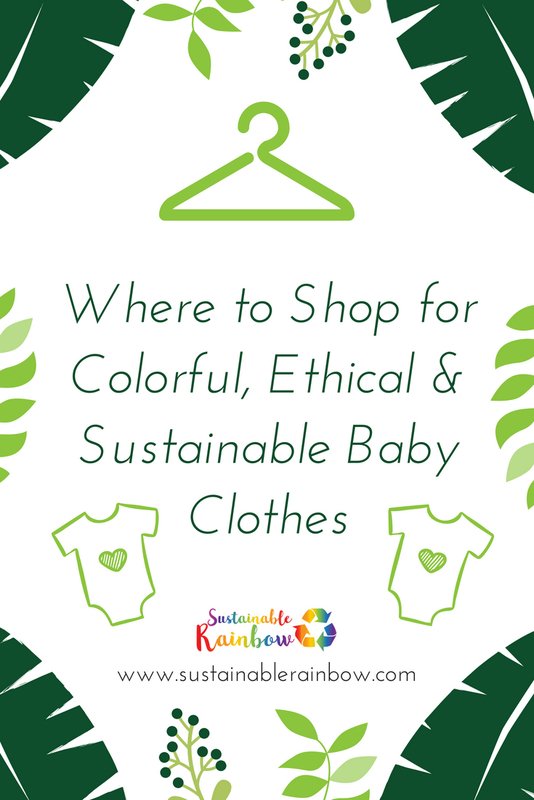 This is the second installment of my brand guide to colorful, ethical and sustainable shopping; it focuses on baby clothes, a topic I never thought I'd be writing about! My husband and I are expecting our first child in November and now that we are starting to register for baby items, I realized how challenging it was to find colorful clothing that was ethically made and gentle on baby's skin (there's a great article here on why organic clothing is more important for babies than it is for adults), so after doing my own research I compiled this list to make it easier for other parents and parents-to-be! Brands on this list cover the spectrum of being colorful as well as ethically made, sustainably made and/or are eco-friendly. Many brands cover all of these categories while some only cover one. Keep in mind that choosing to shop a brand that values even one of these areas versus a brand that values none of them is a huge step in making these companies successful, while showing other brands that consumers DO care about these values. I have dedicated separate articles to each of the categories I've researched. The first article was all about women's apparel, and I have created lists for other categories including footwear, swimwear, underwear, bags/accessories, jewelry, athletic wear, maternity/nursing wear, menswear and home goods which will be published soon. Some brands may appear on multiple lists if they sell products that match different categories (for example, if they sell clothing and bags, they will be on both lists). This list will be updated as I learn of new brands, and I encourage you to comment below with some of your favorite brands that I can add to the list! Apple Park- Organic cotton baby clothes, accessories, toys, blankets, towels and eco-friendly backpacks and lunch bags. They are based in San Francisco, CA and manufacturing is done in China with GOTS-certified cotton, sustainable rubber wood, and without phthalates, lead, or flame retardants. They and are committed to creating environmentally responsible and luxurious products for babies and children. The company is “inspired by classic children's toys, reinvented with the finest eco-friendly materials available”. This a great place to grab eco-friendly holiday gifts for new arrivals in the family! ARQ- Organic basics for babies, kids, and women. Their products are ethically made in the USA using cleaner manufacturing processes. “We seek out sustainable fabrics, environmentally friendly dying processes for our custom dyed styles, and our clothes are designed to be versatile and durable. Fewer, better things for our children will help them to foster thoughtful habits toward a richer, more deliberate lifestyle.” This brand is great for the minimalist who likes a bit of color in their wardrobe. Burt's Bees Baby- You probably know Burt's Bees for their chapstick and skincare products, but they also have a line of baby and kid products that includes clothing, bedding, and skincare. They use 100% organic cotton that has been GOTS certified. They also donate products around the world and employees volunteer in their community by cleaning up beaches or working on urban farms. Colored Organics- As the name implies, their products are super colorful and produced with GOTS-certified organic cotton. They pay above-standard wages to every worker so they can provide for their families. Workers are capped on how many hours they can work per week, are granted vacation time and holidays, and are guaranteed safe working conditions. Unlike many mass-made children's brands, they believe in never using child labor, stating "We want children to play in our clothes, not make them". They also donate up to 50% of all profits to help give orphaned children in India a home. Estella NYC- Ethically made baby clothes, blankets and handmade toys. They are passionate about using GOTS-certified organic cotton and paying fair wages to support the artisans that create their products. Finn + Emma- They make baby clothes, gear and toys, offering sizes from newborn through 4T. Their garments are made with G.O.T.S. certified organic cotton and non-toxic, eco-friendly dyes, and their toys are made from untreated hardwood or hand-knit with organic cotton yarn. They care about quality construction, using long-lasting materials and creating designs that are timeless that will last for years. They care about ethical manufacturing, and ensure their employees are paid a living wage while working in safe conditions, helping them build independent lives for themselves and their families. They sell knit dolls that are handmade at a womens’ collaborative in Peru. Knitters work from home, allowing them to care for their families as they earn a living. Franke Jones The Label- Sustainable and ethically made women’s and baby clothing, based in Australia but shipped worldwide. Their products are made with GOTS-certified organic cotton (though it is unclear if every product is made with this material), and they use non-toxic, chemical-free water based inks in their designs. They support local artisans and communities in Australia as well as around the world, providing support for traditional handcrafting techniques, and their pieces are made in ethical, fair-trade workshops. Freedom Kids- Their tagline is "fun, ethical and gender-neutral clothes", and they offer sizes from newborn-young adult. They are based in New Zealand and they ship worldwide. They have a strict ethical code of conduct for their manufacturers which includes no child labor, no forced labor, living wage payment, safe and healthy working conditions, and the right to speak out and defend and improve their own labor rights. Many of their products are Fair-Trade Certified. They are passionate about sustainability and use organic fabrics, deadstock/off-cuts, produce smaller runs of their products (promoting the "slow fashion" model), and use recycled packaging that is recyclable/biodegradable. Hanna Andersson-Organic clothing for children ages 0 to 14 years old. They have been making clothes for over 30 years and care about what goes into their garments (and what doesn't). From their website: "most hannas are OEKO-TEX® Standard 100 certified, which means they're tested down to the very last strand of thread for over 100 harmful substances, using strict European certification standards." They also give back to kids in need by donating clothing and money to non-profits, emergency relief and small local groups. Jazzy Organics- They make colorful rompers, blankets, bibs and hats for babies. They use only GOTS certified organic cotton for their products. In addition, they support Fair Trade to help producers in developing countries achieve better trading conditions and to promote sustainability. Kate Quinn Organics- Based in Seattle, WA, they make baby clothes, bedding and accessories. They are committed to fair trade and protecting the planet, and use organic cotton and bamboo fabrics to craft their designs. They give back through their organization "with love from Africa", with a mission to provide jobs and job training for women in Kenya. This project pays above average wage to its workers and provides them with meals. You can also find their products on Amazon. Lamaze Organic Baby- Organic baby clothes and accessories made in India. They do not have their own e-commerce store, but their products are available at Target, Buy Buy Baby and on Amazon. Their products are made with GOTS-certified organic cotton and the inks and dyes they use are safe for the environment and babies. They believe in supply chain transparency and ethical manufacturing processes, paying workers a fair wage and safe working conditions. They also believe in giving back to their community and supporting the community where their garments are made by donating money to build homes and schools, and increase access to medical services and fresh drinking water. Little Leaf Organic- Organic cotton bedding and unisex baby clothing based in the UK from a family-run company. Their products are all ethically produced and made with GOTS-certified cotton. Their bedding comes in all sizes, from baby to “superking”. They are passionate about sustainability and use “100% recycled paper packaging and stationery. Even the wrapping paper we use for gift wrapping – in our lovely leaf design – is made from 100% recycled paper and is uncoated, printed using vegetable oil-based inks and is fully recyclable. Similarly, the ribbon used for gift wrapping is compostable”. Milkbarn- Baby clothes, burp cloths and swaddles made from organic cotton. Some of their items are made from bamboo, though most appear to be made with certified organic cotton. They are known for their soft materials and adorable prints which have both a nostalgic and modern look. While they don’t have their own e-commerce site, they do retail their pieces through many other sites and shops. Find their items here: Amazon, Spearmint Love, and Barn Chic Boutique. Mini and Meep- Organic baby & mama clothes made by a family-owned company based in North Carolina. They produce their products in an environmentally, socially, and economically responsible manner. They state "Our apparel is made using living-wage labor, and all of our organic unbleached cotton is domestically grown + spun right here in the USA in collaboration with Spiritex, a company that has a ‘farm to fashion’ model using local, sustainable, and ethical resources and practices." They also donate 10% of all proceeds to UNICEF's Children's Rights & Emergency Relief Organization. Mint Rainbow- Sustainable, organic unisex clothing from newborn to adult sizes, handmade in the UK. Their products are also available on Etsy. “Almost all of our fabrics are 100% organic and are treated only with love – not pesticides! Those that are not 100% Organic are of premium quality, are environmentally friendly and use low impact dyes.” All products are made to order by the owner of the shop, Katy, so plan ahead because products take up to 2-3 weeks to make and ship. By making products to order, they eliminate the need for excess production and inventory which shows they care about their environmental footprint. Monica and Andy- Baby and toddler clothes, accessories and blankets in sizes preemie through 6/7. Their products are all GOTS certified organic and lead, phthalate, and flame-retardant free. They make great gift sets including their signature "Hospital Boxes", designed to be everything you need when your baby's stay in the hospital when it is born. They also offer embroidery personalization for an additional fee. Their products are also available at Nordstrom. Morado Designs- Baby bodysuits and tees (sizes 3 months up to 6T), plus totes and bandana bibs. They are all made in the USA from organic cotton, they use eco-friendly water based low-impact dyes, and their packaging is eco-friendly. They have many designs including a collection focused on different states, so they make great gifts! I actually learned of this brand when a girlfriend sent me the cutest "Astoria, NY" themed onesie for our baby (where I used to live and she currently lives). I couldn't find this exact item on their site, so it's possible they offer specific designs in local boutiques. Nui Organics- Organic merino wool and cotton clothing, blankets and booties for babies and kids, based in New Zealand but shipped worldwide. According to the information on their shipping page, their products appear to ship from the US, though it is unclear where they manufacture their products. “Respect for both people and planet has always been at the core of the Nui brand. As much as possible we use certified organic materials and production methods, work with factories that mirror our environmental and social philosophies and constantly seek to improve”. Their products are available for purchase on their website as well as on Amazon. Oeuf NYC- Baby and kids clothes (newborn to 6 years old), furniture, decor and bedding. Their products are made in Bolivia, Peru and Latvia, and each location has their own "how it's made" page on their site. The company values Fair Trade, which includes payment of a fair price, ensuring no child labor or forced labor, commitment to non-discrimination, gender equity and women’s economic empowerment, ensuring good working conditions, and respect for the environment. They also support sustainability, using eco-friendly materials such as GOTS certified organic Pima cotton or alpaca (which is sheared humanely without harm to the animals). Olen Organic- “Mindfully made” organic baby clothes and blankets. All products are made with GOTS-certified organic cotton. They use water-based dyes and their snaps are nickel-free. They believe in giving back, and they encourage their customers to do so as well. When you purchase one of their Hello Baby Better Bundles, a portion of the sale is donated to PL+US, an organization fighting to win paid family leave for all in the United States. When your baby outgrows their clothing, they make it easy to responsibly recycle it. These items can be donated to new homes in your community using a pre-paid shipping label, courtesy of their partner Give Back Box. Organic Baby Love- Baby, toddler and mama clothing and accessories company based in Gilbert, AZ. Their products are all handmade with organic fabric. They care about sustainability and safety, ensuring that all of their products are chemical-free. They also offer custom designs as well as mama-and-me matching outfits. Pact- They sell adult clothing as well as baby and toddler items (from Newborn-5T). They ar passionate about organic cotton, fair trade and fair prices. Everything on their site is quite reasonable in price and they offer lots of basics in many colors. Their kids items are all under $20, with some starting as low as $5! Patagonia- Truly the pioneers of sustainable fashion, they have been around for almost 50 years. Their mission is "Build the best product, cause no unnecessary harm, use business to inspire and implement solutions to the environmental crisis." They are very transparent about their supply chain, with a goal "to reduce the adverse social and environmental impacts of our products and to make sure they are produced under safe, fair, legal and humane working conditions throughout the supply chain." They are passionate about their environmental impact, utilizing eco-friendly fabrics including organic cotton and working as activists to combat the environmental crisis. Ultraviolet Kids- Ethically produced baby and children's clothing, made in Los Angeles, CA. They care about sustainable fashion and utilize sustainable fibers and deadstock fabric to create their designs. When you purchase one of their turbans or skull caps, they donate one to a baby, kid or teen going through medically induced hair loss. Under the Nile- Their philosophy is "to enrich the planet and the lives of everyone involved with our business, from 'cotton to customer'." They make clothing, toys, blankets and home goods with high-quality organic Egyptian cotton and offer sizes ranging from newborn-6 years old. Their products are all manufactured ethically, where workers have the right to safe, healthy and clean work environments, are treated with dignity and respect, and are paid living wages. They believe in empowering women and giving back to their community through a program that provides meals, education, income and opportunities to local families living in poverty. Also, how cute are their handmade fruit and veggie toys?! Their products are also available on Amazon. 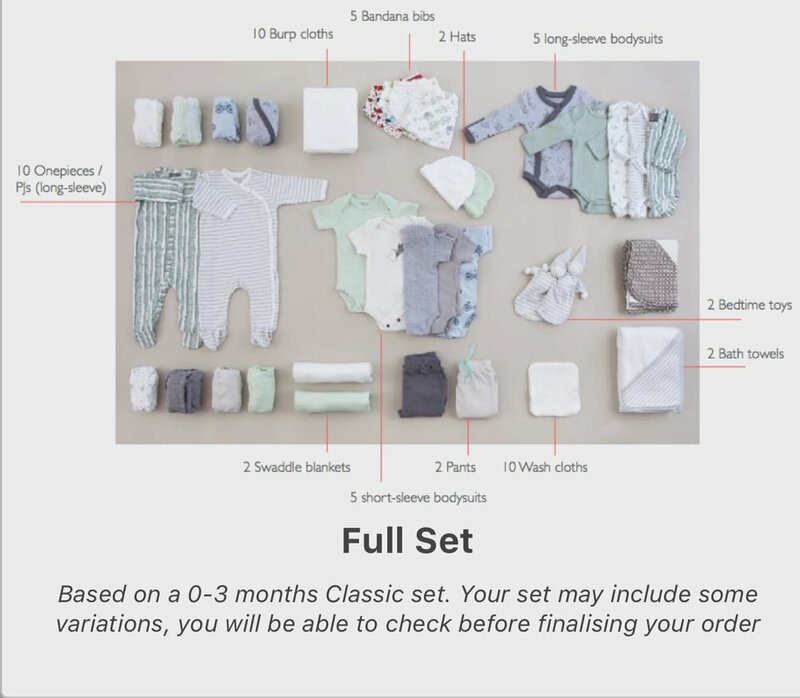 Upchoose- This is not a brand of clothing, but a service that offers "the easiest and most sustainable baby wardrobe solution". Currently, they offer organic baby clothes from newborn-24 months old. 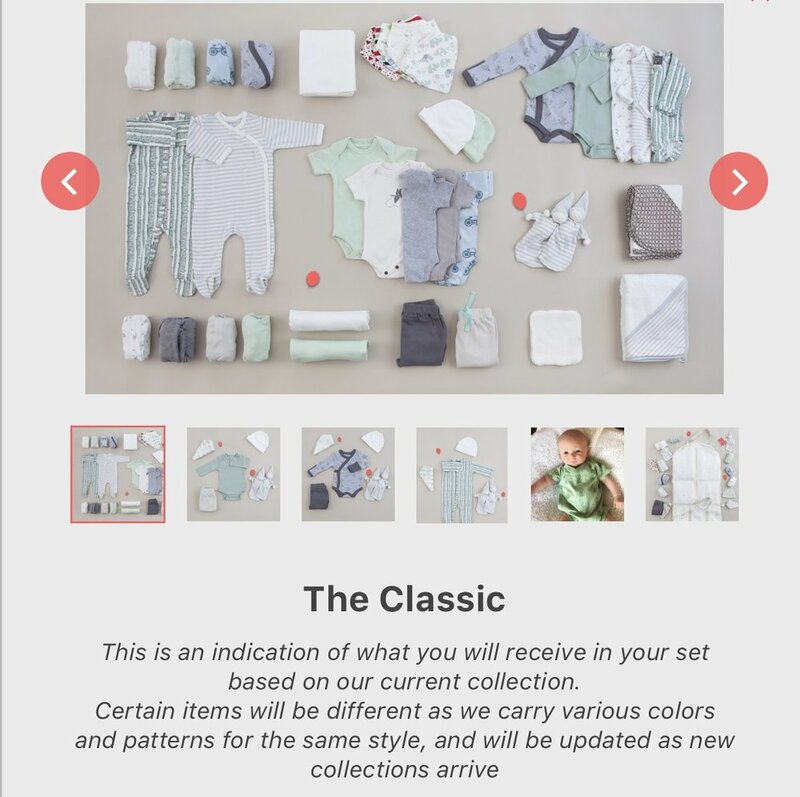 You select the age of your baby, your style "the classic" or "the playful" (both are unisex), the season "mild" or "warm", whether you want a "full set" or "clothes only", the set is delivered to your door (it is not a subscription service, though aspects of it feel similar to one), and when your baby has outgrown the items, you ship the items back and receive a credit to spend on the next size up. The really cool part about this service is you have the option to order a new set or a preloved set, which is less money. New sets are still 40% off of original retail price, and preloved sets are 60% off of original retail price. The brands of clothing they source from are all brands on this list and all use certified organic cotton. This model feels like a capsule wardrobe for a baby and takes all of the guesswork out of what your baby needs. 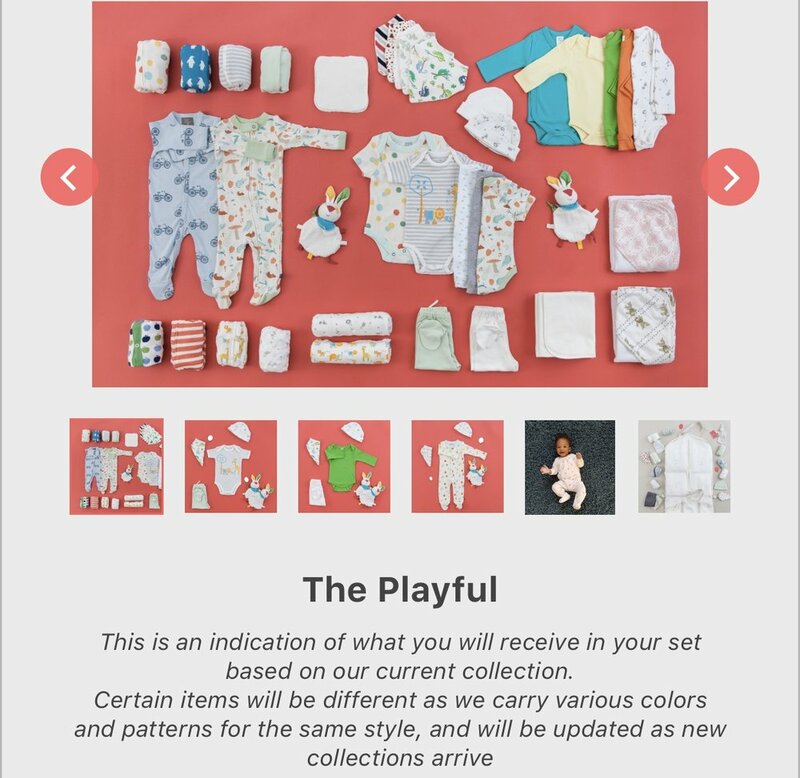 They also offer free shipping and returns, making it easy to swap pieces out when you're ready (plus, you aren't stuck with clothing your baby no longer fits into). *After publishing this article, Upchoose reached out to me to offer a coupon code to my followers for $25 off of any set you order from their site. Enter code SUSTAINABLERAINBOW18 on Upchoose.com to redeem! Winter Water Factory-A Brooklyn-based design and manufacturing company specializing in screen printed textiles and organic kids' clothing. They offer sizes from newborn-size 8 in kids, plus women's tops and dresses (in coordinating patterns so you can match with your kiddo!). They also make baby accessories as well as bedding. All items are made with 100% certified organic cotton and every part of the manufacturing process takes place in Brooklyn, NY. By producing locally, they show they are committed to environmentally friendly practices as well as ethical labor standards. What are some of your favorite colorful and sustainable, ethically made or eco-friendly baby brands? Comment below and I will update the list periodically to include more awesome brands who prove that fashion doesn't have to be fast to be fabulous! Stay tuned for future posts featuring brands from categories including footwear, swimwear, underwear, bags/accessories, jewelry, athletic wear, maternity/nursing wear, menswear and home goods!